Well, with forcast temperatures in the teens, we decided we wouldn’t be getting much work done this weekend. Plumbing? Nope. Too cold to crawl around under the house. Wiring? Attics are cold too. Insulating? Well, maybe. Lord knows it needs to get done. But no. Too durn cold. Aside from that, I put in some “hours” this week, and needed some extra sleep. Heh…yeah, I didn’t stir out of my bed until 11am Saturday. The warm, willing wife lying there with me was some incentive I expect. Guy’s gotta have a day off every now and again. This week the UPS fairy brought me a full-body harness and some orange traffic cones. Along with the pads and chocks I made last weekend, those will go in the toolbins on the left-handed fargle-snorker to be used as needed. Or perhaps never to be seen again, but at least I have them. Of course, as much as I like to play with tools…there is no way in HELL I’m breaking out the left-handed fargle-snorker in temperatures in the teens and twenties…I mean….elevating onesself 40 feet in the air…the twenty degree and 30mph air…seems somewhat masochistic…even for me. 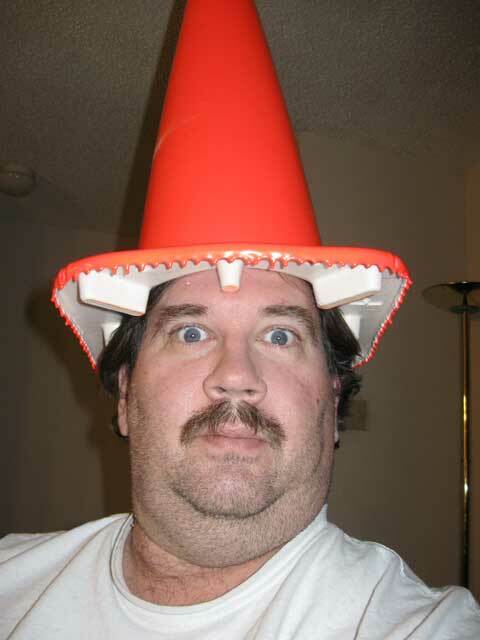 In the mean time though, I thought it prudent to test out the traffic cones. As most of you know, they are used for marking hazards. 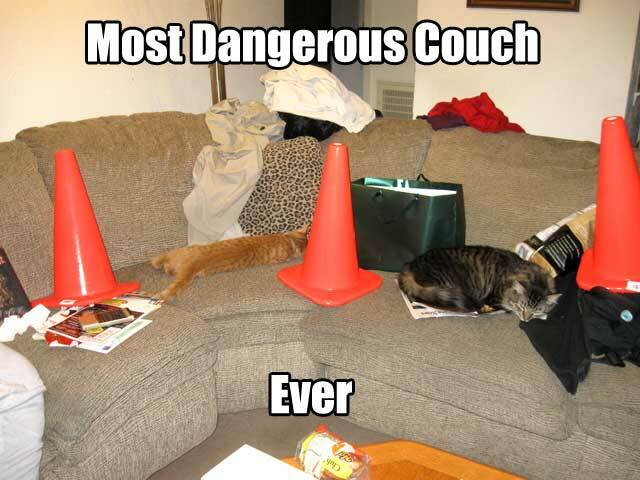 The most dangerous couch. Ever. We’re supposed to have milder temperatures next week…so maybe we’ll get some work done then. Until that time, y’all take care! This entry was posted in Pets, Tools. Bookmark the permalink.